Dozens of communities across Nepal are still struggling to recover from the devastation caused by the earthquakes that struck in April 2015. After the immediate emergency response was completed, Projects Abroad launched the Building Project in June 2015 to help communities recover and rebuild. 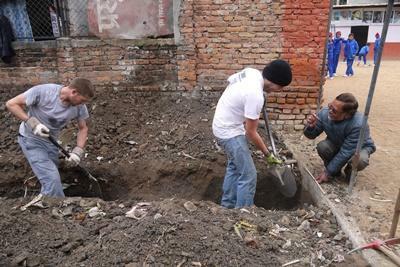 Since then, our volunteers have made a significant progress in the Kathmandu Valley. However, there is still a great deal of work to be done and volunteers are needed to continue helping communities get back on their feet. The major focus of the project is on helping children in affected areas. This is especially important for Projects Abroad, as we want to make sure that every child in the community has access to a safe learning environment. More than 50,000 classrooms were damaged or destroyed in the earthquake and there is an urgent need to set up alternative learning spaces. With the assistance of volunteers, Projects Abroad has worked on and completed several reconstruction projects so far. Damaged schools have been rebuilt and renovated and in communities where this has been impossible, new temporary or permanent classrooms and school buildings have been constructed. We have also partnered with Nepal Youth Foundation UK, an international NGO with over 25 years’ experience. Their work has made a significant impact on improving the health and education of Nepal’s children. Through this partnership, we are able to repair or rebuild public schools that were damaged in the earthquake and that the Nepalese government has not been able to fund yet. 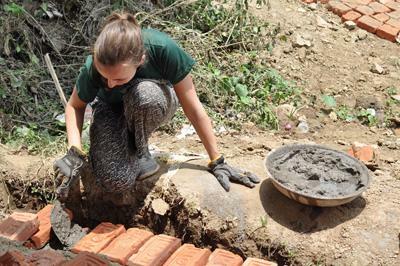 As a Building volunteer in Nepal, you will work at sites based in urban and semi-urban areas in the Kathmandu Valley. The project will expand into other regions as work is completed and participation grows. The type of work you will do is dependent on what stage of the construction the project is at when you arrive. You don’t need any previous construction experience to participate, as our volunteers work under the supervision of a professional mason and a qualified construction engineer, as well as a Projects Abroad coordinator. They will teach you everything you need to know about building. You can join this project at any time and stay for as long as you choose. You must be reasonably fit to participate. During your time in Nepal, you will be accommodated in a guesthouse and you will be supported by full-time local Projects Abroad staff. 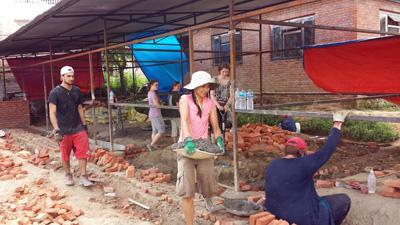 You can join the Building Project in Nepal from one week if you don't have time to join us for four weeks or more. This project has been selected by our local colleagues as being suitable for short term volunteering for both the host community and the volunteer. Although you will gain a valuable cultural insight and work intensely within the local community please be aware that you may not be able to make the same impact as someone volunteering for a longer period and may not see the completion of some of the building work. In the wake of the earthquakes in 2015, we ran a Disaster Relief Project that addressed immediate needs in Nepal. To learn more about this work and what the project achieved, please visit our Disaster Relief in Nepal page.